Autumn Berry Inspired, a local business based in Urbana and SBDC client, was featured in the August 28th edition of the Illinois SBDC Network Weekly Connection newsletter. Recently, Autumn Berry Inspired LLC, a client of the Illinois Small Business Development Center at Champaign County Economic Development Corporation, achieved an important success. 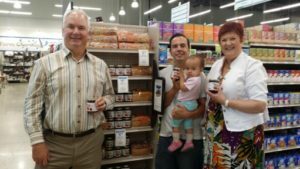 Their locally foraged and produced wild Autumn Berry Jam is now available at the Harvest Market grocery store in Champaign. In 2011, Mr. Kelly realized the little red berries growing on the bushes near his home were delicious. A quick web search revealed that the bushes were autumn olive (Elaeagnus umbellata) and the fruit was nutritious and safe to eat. The USDA says the fruit is packed with antioxidants, especially lycopene. Originally from Asia and intentionally introduced into America, the autumn olive was declared an invasive species in the 1980’s and had fallen out of favor. Once you learn to identify it, Mr. Kelly explains, you will spot it in parks and along highways and the fringes of farmlands throughout the Midwest and Northeastern US. “It’s everywhere,” he says. Autumn Berry Inspired LLC was born in 2012 based on this idea of using a prolific pest for good. Mr. and Mrs. Kelly harvested berries from their land, made jam, and sold it at the local farmers market, and to other food-makers like Pandamonium Doughnuts and Big Grove Tavern. Before long, a local brew-pub, The Blind Pig, contacted them to buy Autumn Berries to make a tasty Autumn Berry Beer. The taste is sweet and tart—somewhere between cranberry and pomegranate. And the price for these super-berries is not through the roof. Autumn Berry Jams retail around $6 for an 11 oz. jar and Autumn Berry Puree is available for around $4 /lb. Shipping is available. Learn more about the company at http://www.autumnberryinspired.com/.